Pet owners are notorious for dressing up their pets in costumes. Depending on the costume, they can either bother the pet or just make it look cute! Here is a collection of 20 of the best, most adorable photos of pets dressed up in costumes. The looks are all over the place, but each one of them is certified cuteness. That photo background might just be a wallpaper, however, it makes for an adorable picture! There’s nothing you can do or say to make this feline any less cute. People love to dress animals up like humans or other things. And this picture is no exception of that. 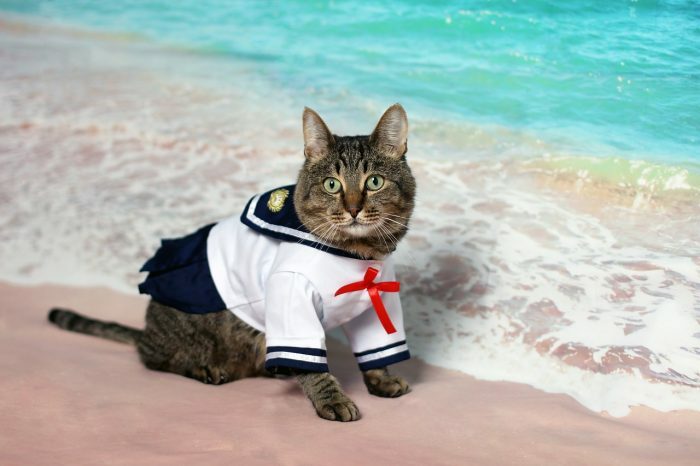 I wouldn’t let this kitty sail any boat I’m on. However, it is fun to look at! Keep reading to see more adorable pictures of animals that got dressed up in costumes.